Since I have given coverage to To/Die/For earlier, in order to remain equal opportunity gothic rock I have to mention that Entwine, another second-long infatuation from a day back when, also had an album in 2015. Coming out after what seems like a long period of silence, Chaotic Nation has all of the trappings of the genre – chunky power chord driven songs, atmospheric walls, obligatory keyboard arrangements, somewhat whiny (but much less so than before) vocals - all of this desperately vying for radio play. Given that Chaotic Nation has no sound or production issues like the latest To/Die/For Cult, on the surface the album succeeds within its stated goals to play sugarcoated gothic rock/metal, but either I have outgrown the genre or Chaotic Nation simply does not hit enough right buttons for me to like it completely. Sure, there are a few decent catchy rockers here. No Losing the Ground or Snow White Suicide from Gone, End of Silence and Adrenalize do well, the latter probably a hit single from the album, with proper keyboard contribution and extra attention paid to leading guitar work. But when fuzzy chug covered in downtuned intensity takes center stage, as in modern slamogroove of Saint of Sorrow or Plastic World, my mind exits. The lyrics on these two … don’t get me started about the angst. And to think of it Entwine started out as death metal back in mid90s, and retains most of the lineup too. This is still better than soppy/sappy Revolt for Redemption or sugary yuck of As We Arise even latter day Sentenced would not be caught dead playing. Keyboard coverage in Fortune Falls, the take on the word play in the song’s title, may not be palatable to some, but I actually grew to accept that song, and will take it any day over the pseudo heavy drive to sound modern and radio acceptable as in many other instances on Chaotic Nation. To be fair, Entwine takes interesting sidesteps with heavier stoner Lost, but Still Alive (which they still manage to bury in grunge) or lounge piano populated, step dance rhythmically syncopated The Evil Lives in the Shadows with an excellent bridge/chorus hook. Closer Scream brings out the needed so sought after emotion in its latter half, but it will take patience to get through the first chugging part. 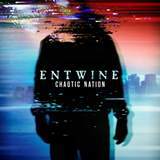 Chaotic Nation is far from disaster, but for me Entwine peaked about 11 years ago and Losing the Ground is still the best track I heard from them. Since I have not heard much since Gone anyway, that may not be entirely surprising.